Turkey with its capital Ankara is located in Asia (Southeastern Europe and Southwestern Asia (that portion of Turkey west of the Bosporus is geographically part of Europe), bordering the Black Sea). It covers some 783,563 square kilometers (slightly larger than Texas) with a population of 80,845,200. Turkish, Kurdish, Azerbaijani and Avaric are the languages spoken by people in Turkey (consider regional differences). Armenia, Azerbaijan, Bulgaria, Georgia, Greece, Iran, Iraq and Syria are bordering countries. Turkey is on the Mediterranean, in the Anatolian region of West Asia, with a small section in Southeastern Europe separated by the Turkish Straits (Bosphorus, Sea of Marmara, and Dardanelles). As a general rule, most museums and sites of ancient cities in Turkey are closed on Mondays, although there are numerous exceptions to this. At the crossroads of civilizations, all parts of Turkey are full of a mindblowing number of ancient ruins. While Turkey is rightly renowned for its warm Mediterranean beaches, wintersports, especially skiing, is very much a possibility—and indeed a popular activity—in the mountainous interior of the country between October and April, with a guaranteed stable snowcover and constant below freezing temperatures between December and March. Some more eastern resorts have longer periods of snowcover. The topography is high central plateau (Anatolia) with narrow coastal plain as well as several mountain ranges. The average density of population is about 103 per km². The climate in Turkey can be described as temperatehot, dry summers with mild, wet winters, harsher in interior. Potential natural disasters are flooding, landslides, limited volcanic activity; its three historically active volcanoes; Ararat, Nemrut Dagi, and Tendurek Dagi have not erupted since the 19th century or earlier and severe earthquakes, especially in northern Turkey, along an arc extending from the Sea of Marmara to Lake Van. To reach someone Turkey dial +90 prior to a number. The local cellular networks are operated on 900 MHz, 1800 MHz, 3G, 4G. Websites typically end with the top level domain ".tr". If you want to bring electric appliances (e.g. battery chaarger), keep in min the local 230 V - 50 Hz (plugs: C, F). The sign for the locally used currency Lira is TRY. 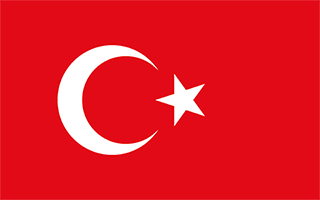 Red with a vertical white crescent moon (the closed portion is toward the hoist side) and white five-pointed star centered just outside the crescent opening; the flag colors and designs closely resemble those on the banner of the Ottoman Empire, which preceded modern-day Turkey; the crescent moon and star serve as insignia for Turkic peoples; according to one interpretation, the flag represents the reflection of the moon and a star in a pool of blood of Turkish warriors. Modern Turkey was founded in 1923 from the remnants of the defeated Ottoman Empire by national hero Mustafa KEMAL, who was later honored with the title Ataturk or "Father of the Turks." Under his leadership, the country adopted radical social, legal, and political reforms. After a period of one-party rule, an experiment with multi-party politics led to the 1950 election victory of the opposition Democrat Party and the peaceful transfer of power. Since then, Turkish political parties have multiplied, but democracy has been fractured by periods of instability and military coups (1960, 1971, 1980), which in each case eventually resulted in a return of formal political power to civilians. In 1997, the military again helped engineer the ouster - popularly dubbed a "post-modern coup" - of the then Islamic-oriented government. A coup attempt was made in July 2016 by a faction of the Turkish Armed Forces. Turkey intervened militarily on Cyprus in 1974 to prevent a Greek takeover of the island and has since acted as patron state to the "Turkish Republic of Northern Cyprus," which only Turkey recognizes. A separatist insurgency begun in 1984 by the Kurdistan Workers' Party (PKK), a US-designated terrorist organization, has long dominated the attention of Turkish security forces and claimed more than 40,000 lives. In 2013, the Turkish Government and the PKK conducted negotiations aimed at ending the violence, however intense fighting resumed in 2015. Turkey joined the UN in 1945 and in 1952 it became a member of NATO. In 1963, Turkey became an associate member of the European Community; it began accession talks with the EU in 2005. Over the past decade, economic reforms, coupled with some political reforms, have contributed to a growing economy, although economic growth slowed in recent years. From 2015 and continuing through 2016, Turkey witnessed an uptick in terrorist violence, including major attacks in Ankara, Istanbul, and throughout the predominantly Kurdish southeastern region of Turkey. On 15 July 2016, elements of the Turkish Armed forces attempted a coup that ultimately failed following widespread popular resistance. More than 240 people were killed and over 2,000 injured when Turkish citizens took to the streets en masse to confront the coup forces. In response, Turkish Government authorities arrested, suspended, or dismissed more than 100,000 security personnel, journalists, judges, academics, and civil servants due to their alleged connection with the attempted coup. The government accused followers of an Islamic transnational religious and social movement for allegedly instigating the failed coup and designates the followers as terrorists. Following the failed coup, the Turkish Government instituted a State of Emergency in July 2016 that has been extended to July 2017. The Turkish Government conducted a referendum on 16 April 2017 that will, when implemented, change Turkey from a parliamentary to a presidential system.